A standing waste tub repair. The stain on the china tub, under the button spout, tells you the valve leaked for a long time before I worked on it. This Speakman shower system is in a house in Oregon City. 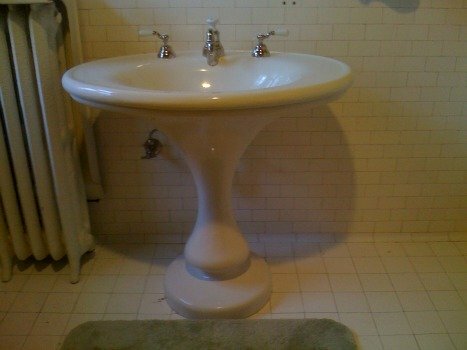 Even with the tile off, when many people would put in new valving, I was asked to restore this system to full functionality. I was even able to find replacements for broken porcelain escutcheons. My name is Brian Marrone. I am originally from Long Island N.Y. There at age twelve I began to work with wrenches, repairing bicycles. At age 17 I started my first full time work, in a bowling alley maintaining AMF pin-spotter machines. I relocated with my family to Portland, Oregon in 1968 and graduated from David Douglas HS in 1969. Once out of high school, I joined the US Navy and served in Hospital Corps till 1973. During that time I worked at the base bowling alley wherever I was sent. 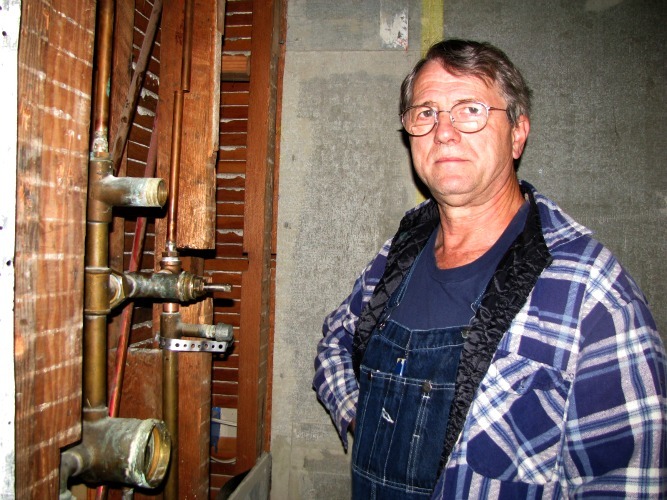 I attended various colleges, still working as a mechanic at various bowling alleys, until 1978 when I took a job with a plumbing company. By 1984 I was licensed and self employed, having founding Brian's Plumbing Works, which I still own and operate. 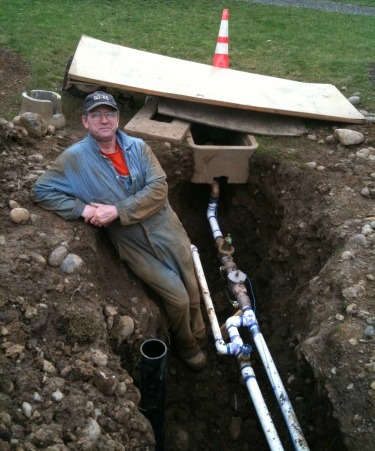 Through the years I have worked on all manner of plumbing jobs, striving to learn daily. 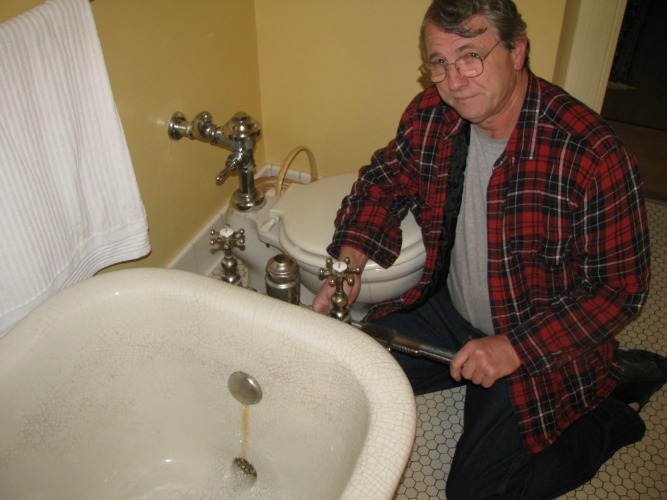 I found my greatest challenge and satisfaction to be the repair and restoration of vintage plumbing fixtures and began to seek that work primarily. I still try to learn daily. 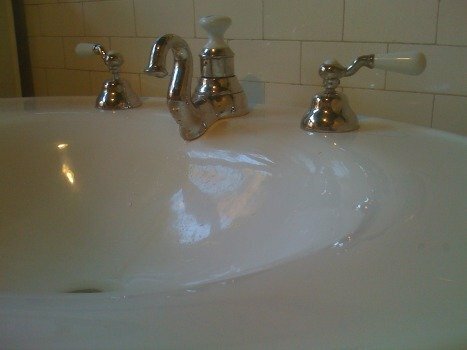 Building this Plumbing Geek website, with the help of my wife and SBI (Solo Build It) has been and is a challenging undertaking. I plan to expand it greatly, and hope you find it useful now and in the future. Not all my work is on vintage fixtures yet. This 2" commercial water line kept my crew and I busy during a slow period. The trenching was done by the owners men. 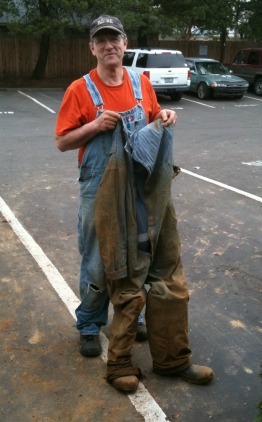 Another day as "Mud Man". Be happy in your work!